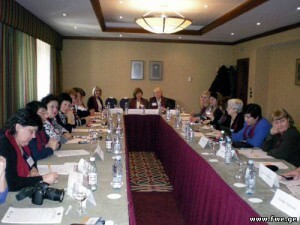 On December 4-6, the representatives of Fund of Women Entrepreneurs participated at the conference of Georgian and Russian women-peacemakers, organized by Fund “Sukhumi” (Georgia) and “The Union of Don Women” (Russia), with support of Swedish women foundation KVINNA TILL KVINNA. The meeting participants discussed possibilities of restoring interpersonal contacts and good neighborly relations between the two countries in the complicated conditions of political confrontation. At the conference, there was elaborated the action plan, the will be basis for further peace processes. On November 25-27, a Swedish non-governmental organization “Operation 1325” conducted the conference on the topic: “Reform of Security Reform and the UN Reosolution 1325”. At the conference there were involved national organizations, as well as the representative from government structures and European Union. 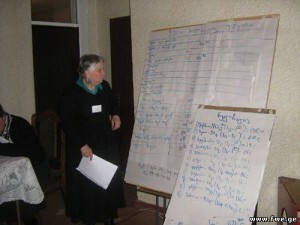 Three-day training considered plenary sessions and group works. 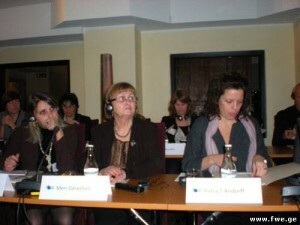 In the delegetion of five women from Georgia there were represented Alla Gamakharia (Chairperson of Fund “Sukhuimi”) and Meri Gelashvili (Chairperson of Fund of Women Entrepreneurs). There were discussed the following issues at the conference, like state security, human security and gender issues in relation to the reform of security sector. On September 23rd, the round table was conducted on the topic: “Building of economic relations with conflict regions – one of the ways of restoring confidence”. The meeting was dedicated to the “International Peace Day” (September 21), announced by the UN General Assembly in 1981. 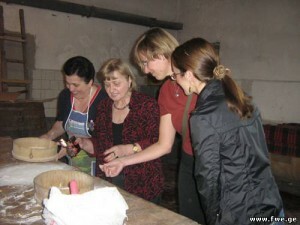 The beneficiaries of Fund took participation – women entrepreneurs and trainees of vocational trainings. At the begining, the presentation was made of the informational journal “Woman and Business”, as well as the breif report on the activities carried out during first half of this year. After this, the invited expert Alu Gamakharia made interesting speech on the issue of NGOs’ role and importance in conflict resolution and regarding peace processes within economic framwork. The paticipants activley debated on the presented topics. Fund of Women Entrepreneurs conducted the round table with participation of women entrepreneurs and the trainees of vocational trainings, in all twenty-three women. The main purpose of the meeting was exchange of experience and discussing of the problems revealed in working process, looking for the ways of solving then and elaborating recommendations. “We have continued execution of the activities started in previous years, and actively support IDP women’s involvement in small business. The project anticipates research, educational, informational and other measures contributing to women’s involvement in small business and increasing their role in the society and in the family” – stated Meri Gelashvili (Chairperson of fund of women Entrepreneurs). The trainees of vocational training courses mentioned how much important for them possibility of obtaining needed skills. Women Entrepreneurs, in their speeches, mainly underlined that their families have little but stable income that certainly improves their social condition. From 2nd to 6th of November, a representative of Fund of Women Entrepreneurs, Diana KUrashvili, participated at the seminar initiated by the Poland Non-Governmental Organizations Coalition (Non-Governmental Development Organizations-NGDOs). At the first day, the coalition director Viochekh Tvorovsky spoke about work of non-governmental sector, why they exist, what should be fields of their activities, mechanisms of cooperation. The participants’ attention was also drawn to establishment of coalitions and choosing of potential partners. In the course of training, the trainers touched importance of volunteers’ work, forms of their actions. Monika Melinger highlighted the social economics and role of NGOs. Development of agro-business, elaborating of a project and its stages, fundraising, problem analysis – Anna Zorovyetska presented very interesting materials on these issues. Each topic was discussed together with reviewing of examples with high activity of the participants. At last, it is worth mentioning, that the training was conducted with the support of Ministry of Foreign Affairs of Poland. More twenty-three young women have passed English language course. They were divided into two groups: beginner and intermediate. It is worth mentioning that similar courses are important for Fund’s beneficiaries as they are provided with the opportunity to improve knowledge of language free of charge. There are many people who have desire to pass the course. 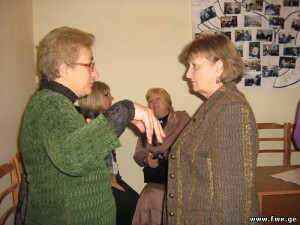 Therefore the next three-months course will get start with two groups of young women in Kutaisi. 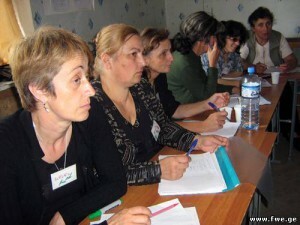 Since November, Fund of Women Entrepreneurs initiated the course of sewing skills in Kutaisi. Five young women, both IDPs and locals, work with great desire to acquire sewing skills. They consider that obtianed knonwledge will help them in future to start their own business and achieve economic independence. Three-months course on basis of accounting will last until the end of December in office of Fund of Women Entrepreneurs, with participation of IDP and local young women. The course program cover the following issues: general characteristics of accounting, turnover of funds, relations with bank, tax legislation and others. With the purpose of deepening the obtained knowledge, the practical lessons are rendered around the discussed theoretical material. The third group of IDP women has started the course of knitting on machine. Two young women work three days per week. The course program anticipates the following issues: technique of security, selecting of materials, three methods of starting to knit, taking the measures, calculating of a model, knitting of pocket and buttonhole, knitting of pullover and dresses of different forms, knitting of socks, caps and scarves. Three-month vocational training courses finished in Poti and 44 beneficiaries obtained the following skills: in computer techniques – 13 students, English language – 15 students and accounting – 16. English language course students increased their knowledge and can now freely speak on various topics and translate the texts of average difficulty level. The beneficiaries, at the computer courses mastered their skills in MS Office Software and Internet usage. Accounting courses meant to introduce the theoretical material and practical exercises, and the accumulation of knowledge for future usage on computer accounting program “ORIS”. With the initiative of Fund of Women Entrepreneurs, conduction of vocational training is planned in Women Support Centre, established in Khoni – Public school #4. In particular, the beneficiaries of Fund – IDP and local women – will have possibility of obtaining computer and English language skills, as well as learn sewing. This centre will render important assistance to IDP and local women in terms of enhancing professional skils. Within the project, Fund of Women Entrepreneurs incuded a new direction of activity, anticipating vocational training of the beneficiaries. In May, there have been organized English language, computer skills and knitting courses. Each of them lasts three months amd IDP women and girls have possibility to attend them. “Free courses are excellent chance for us to develop our English and computer skills. The obtained knowledge will necessarily make it easy for us to find job” – states Ia Kvitsiani. Fund of Women Entrepreneurs conducted the next business-training with participation of women IDPs (15 participants), living in Khoni – former military settlement. The aim of the seminar was teaching of basis of small business, in order to create the best work places and improving beneficiaries socio-economic conditions. The training thematic covered the following issues: concept of small business, elaborating of small business-plans, its structure and purpose. In the course of seminar the participants came to the conclusion that purposefullness, desire and right choicec contributes to successful execution of business idea. After the group work, there were presented five business-plans. The women tried to reveal their capacities as much as possible. The presentations reflected a strategy for implemeted task. At the completion, the participants have possibility to elaborate and present to the competition commission really executable, sustainable and stable projects. On April 21-24, Fund of Women Entrepreneurs conducted the training in basis of small business, with participation of the women IDP from different collective centres of Kutaisi (in all 15 participants). The training process also included the discussions on the business issues. The theoretical part was followed by the various exercises for getting better acquainted with business-relations. After the training, the participants were given chance to present their business-projects to the competition commission. From the submitted sic projects there were chosen the best four and accordingly four work places have been created. On July 28th – 31st, Fund of Women Entrepreneurs conducted the next training in Zestaponi on the topic of small business basis in Zestaponi, with participation of fifteen women from different collective centres of IDPs. The thematic, anticipated within the program included the issues like women’s leadership, legal forms of starting business, small business management, methodology of business-plan, marketing plan and etc. In the course of training, the participants actively discussed on interesting issues for them and obtained useful advice from the trainers. At the completion of the training, the participants had possibility of submitting their business-projects to the competition commission and as the result of revision, there have been chosen four best business-plans and the same number of work places were created.